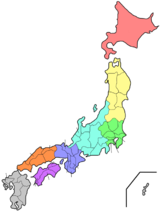 Saga Prefecture (佐賀県, Saga-ken) is a prefecture of Japan in the Kyūshū region of Japan on the island of Kyūshū. The capital city is Saga. The area of Nagasaki Prefecture and Saga Prefecture was formerly called Hizen Province. The current name dates from the Meiji Restoration. In the Edo period this area was called the Saga Domain (佐賀藩, Saga-han). "The Seven Wise Men of Saga" is the name for seven men from Saga. Each of them was important to the development of modern of Japan. They began changing the country around the end of the Tokugawa Shogunate. They continued modernizing Japan during the Meiji Restoration. Lord Naomasa Nabeshima was lord of the Nabeshima clan. He brought in European technology and culture. Sano Tsunetami started the Japanese Red Cross. Soejima Taneomi was a Diet member, Foreign Minister, and Minister of Domestic Affairs. He was also a well-known writer and poet. Ōki Takatō was Minister of Civil Affairs, Education, and Legal Affairs. He was a Diet member. Eto Shimpei, also once a Minister of Legal Affairs He was a Diet member and started Japan's system of courts and judges. Ōkuma Shigenobu was Prime Minister of Japan. He also started Waseda University. 1874 (Meiji 7): Saga Rebellion. Saga is the smallest prefecture on Kyūshū. It is bordered by the Genkai Sea and the Tsushima Strait to the north and the Ariake Sea to the south. Nagasaki Prefecture is on its western border. Fukuoka Prefecture and Kumamoto Prefecture are east of Saga. Yodohime jinja and Chiriku Hachiman-gū are the chief Shinto shrines (ichinomiya) in the prefecture. ↑ Nussbaum, Louis-Frédéric. (2005). "Saga prefecture" in Japan Encyclopedia, p. 804; Japan External Trade Organization (JETRO), Saga Prefecture, Regional Information; retrieved 2012-4-6. ↑ Davis, p. 147; the noun "Kōan" means the Japanese era name for a time period which started in February 1278 and ended in April 1288. ↑ Nussbaum, "Saga no Ran" at Japan Encyclopedia, p. 804. ↑ "Saga governor apologizes over remark on Genkai power plant," Mainichi Shimbun. 3 August 2011; retrieved 2011-11-19. ↑ Kyūshū Shinkansen, Information from JR Kyushu; retrieved 2011-11-19. ↑ Picken, Stuart. (2004). Sourcebook in Shinto: Selected Documents, p. 377; "Nationwide List of Ichinomiya," p. 3; retrieved 2012-8-23.